As I tap away on my iPad, with Winnie the Pooh on TV for the second time this evening, one cat snuggled on the sofa opposite and a chestnut and marshmallow candle burning, you're lying on my nap feeling a bit sorry for yourself. You have three new teeth making their bid for freedom right now and a head cold including a tickly cough that's keeping you up at night. Last night was particularly bad as you couldn't settle until 1.30am, and even then you woke a further three times. You really got yourself in such a state and it was horrible to see you struggle so much. I'm not sure how tonight will go but with only two hours sleep under my belt last night, I could do with a little more tonight. Please. 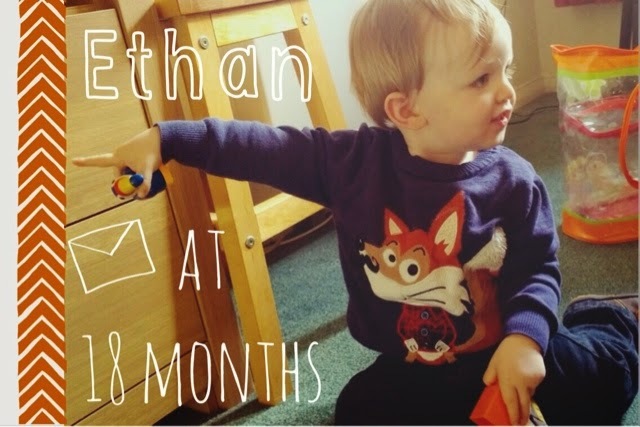 So aside from being a little poorly, what's new with you now you're 18 months? Well, you're almost walking. Almost! You keep tottering along and you will forget yourself and let go or show off and walk back and forth between us with a proud look on your face. You're very proud, as you should be, of lots of things you do and will clap your hands and cheer in delight. You're a chatterbox and a parrot, repeating any funny noise you hear us make and odd words you pick up when we're talking, like 'breakfast', 'crash' and 'good boy'. You've also learnt how to say 'Nanna' and what sounds like 'Gandad' after visiting Namna and Gramps this past weekend over three days. You had such a fantastic time and they both loved seeing how grown up and fun you are. You love Pooh and Thomas still and you seem to understand them more and more plus you seem to know how to work an iPad. Scary! It's amazing watching you grow into a little boy. You're really doing your best to absorb everything and to figure things out. It makes Daddy and I very excited for Christmas as you're just going to be fascinated by it all. You're going to your first fireworks display and bonfire on Saturday and we have your new dinosaur pramsuit ready to keep you warm. You're an affectionate, fidgety, sweet, Pooh obsessed, cheeky and extremely happy and content little boy. You love your dog and cats and all animals you see and you're happy playing alone or with friends and family. You stamp your feet and click your tongue to songs you recognise and you give the best hugs. You're just the best all round. It can be hard, when work is busy for us or when you're having trouble sleeping, plus our backs are really taking the strain with you taking your time to walk, but it's all worth it. Because we have you. And that means we have everything.